Understanding place names in the State of Hawaii is an important first step in planning your trip to the Hawaiian Islands. It all begins with understanding the names of the islands themselves since even this can be confusing to a first time visitor. In addition to their island names and county names, each island has one or more nicknames. Once you get these straight, you can begin to look at which each island has to offer you for your trip. The State of Hawaii consists of eight major islands and a population of 1.43 million according to the 2015 U.S. Census estimate. In order of most populous, the islands are Oʻahu, Hawaii Island, Maui, Kauaʻi, Molokaʻi, Lanaʻi, Niʻihau, and Kahoʻolawe. The State of Hawaii is made up of five counties: Hawaii County, Honolulu County, Kalawao County, Kauaʻi County and Maui County. In order to understand the names that you'll see throughout this site and throughout the State of Hawaii, it's important to recognize all of these names. Let's look at each of the islands individually. O'ahu, nicknamed "The Gathering Place" is the most populous island in the State of Hawaii with a 2015 estimate of 998,714 people and an area of 597 sq. miles. On O'ahu, you'll find Honolulu, the state capital. In fact, the official name for the entire island is the City and County of Honolulu. Everyone on Oʻahu technically lives in Honolulu. All other place names are just local town names. Locals may say that they live in, for example, Kailua. Technically they live in the City of Honolulu. Honolulu is the principal port for the State of Hawaii, the major business and financial center and the educational center of the State of Hawaii. 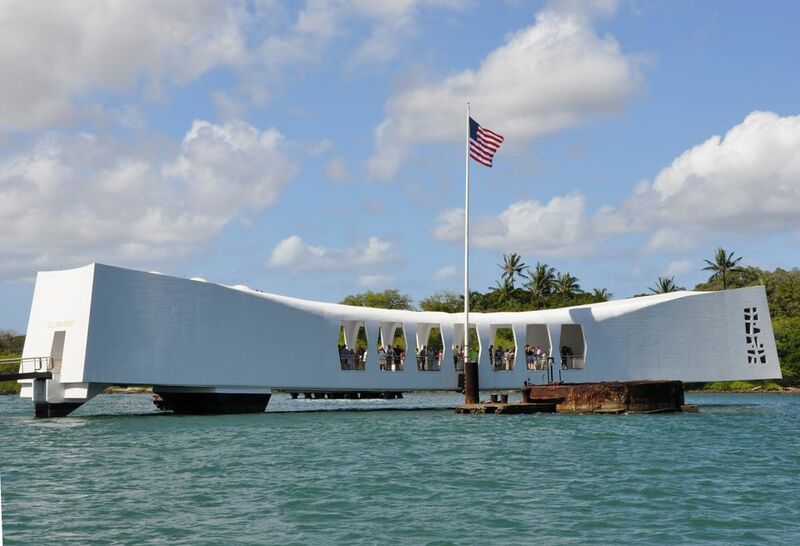 Oʻahu also is the military command center of the Pacific with numerous military bases across the island including the U.S. Navy Base at Pearl Harbor. Honolulu International Airport is the state's largest airport and where most international flights arrive. Waikiki and the world famous Waikiki Beach are also located on Oʻahu, a short distance from downtown Honolulu. Also located on the island of Oʻahu are such famous places as Diamond Head, Hanauma Bay and the North Shore, home to some of the world's best places to surf. Hawaii Island, more commonly known as "The Big Island of Hawaii," has a population of 196,428 and an area of 4,028 square miles. The entire island makes up Hawaii County. The island is most often referred to as the "Big Island" because of its size. You could fit all seven of the other islands inside the island of Hawaii and still have lots of room left over. The Big Island is also the newest of the Hawaiian Islands. In fact, the island is still growing every day due to its most famous landmark - Hawaii Volcanoes National Park where Kilauea Volcano has been erupting continuously for over 33 years. Most of the Big Island is made up of two huge volcanoes: Mauna Loa (13,679 feet) and Mauna Kea (13,796 feet). In fact, Mauna Kea means "white mountain" in the Hawaiian language. It actually snows on the summit in winter. The Big Island is geologically diverse with almost all of the earth's major geological zones except for Arctic and Antarctic. It even has its own desert, the Kau Desert. The island has many beautiful waterfalls, deep valleys, tropical rainforests, and wonderful beaches. The island is home to the largest privately owned ranch in the United States, the Parker Ranch. All sorts of agricultural products are grown on the Big Island including coffee, sugar, macadamia nuts as well as cattle. The two major towns on the island are Kailua-Kona and Hilo, one of the wettest cities on earth. The County of Maui has an estimated population of 164,726. The island of Maui has an area of 727 square miles. It is often called as the "Valley Isle" and is often voted best island in the world. The island consists of two large volcanoes separated by a large central valley. The central valley is home to Kahului Airport. It is also where most of the island's businesses are located - in the towns of Kahului and Wailuku. Much of the central valley consists of sugar cane fields, however, the last sugar cane crop was harvested in 2016. The eastern part of the island is made up of Haleakala, the largest dormant volcano in the world. Its interior reminds you of the surface of Mars. On the slopes of Haleakala is Upcountry Maui where most of the great produce and flowers on Maui are grown. They also raise cattle and horses in this area. Along the coast is the Hana Highway, one of the most famous and scenic drives in the world. Along the southern coast is the South Maui resort area. The western part of the island is separated from the central valley by the West Maui Mountains. Along the western coast are the famous resort and golf areas of Kāʻanapali and Kapalua as well as Hawaii's capital before 1845 and a former whaling port, the town of Lahaina. The islands of Lanaʻi, Kahoʻolawe, and Molokaʻi are the other three islands that make up Maui County. Lanaʻi has a population of 3,135 and an area of 140 square miles. It used to be nicknamed the "Pineapple Island" when the Dole Company owned a huge pineapple plantation there. Unfortunately, no pineapple is grown on Lanaʻi anymore. Now they like to call themselves the "Secluded Island." Tourism is the major industry now on Lanaʻi. The island is home to two world-class resorts. Molokaʻi has a population of 7,255 and an area of 260 square miles. It has two nicknames: the "Friendly Isle" and the "Most Hawaiian Isle." It has the largest population of native Hawaiians in Hawaii. Few visitors make it to Molokaʻi, but those who do come away with a truly Hawaiian experience. Along the islands north coast are the highest sea cliffs in the world and a 13-square-mile peninsula below the high cliffs called Kalaupapa, the Hansen's Disease settlement, officially called Kalawao County (population 90), a National Historical Park. Kahoʻolawe is an uninhabited island of 45 square miles. It was once used for target practice by the U.S. Navy and Air Force and, despite a costly cleanup there are still many unexploded shells. No one is allowed to go ashore without permission. The two Hawaiian Island located furthest to the northwest are the islands of Kauaʻi and Niʻihau. Kauaʻi has an estimated population of 71,735 and an area of 552 square miles. It is often referred to as the "Garden Island" because of its magnificent scenery and lush vegetation. The island has many beautiful waterfalls, most of which can only be seen from a helicopter. It is home to the Waimea Canyon, the "Grand Canyon of the Pacific," the Nā Pali Coast with its towering sea cliffs and lovely Kalalau Valley, and the Wailua River Valley which is home to the famous Fern Grotto. Kauaʻi's sunny southern shore is home to some of the island's best resorts and beaches. Niʻihau has a population of 160 and an area of 69 square miles. It is a privately owned island, with livestock raising as its principal industry. The general public can only visit with permission.